I am not a big fan of Italian food. But my lil one is totally opposite 🙂 All the nakhras and excuses he gives every day during lunch and dinner just vanish if you place a piece of Pizza or a bowl of pasta before him. Last week he was down with cold and fever and completely lost his appetite.. So the only way to make him eat was to cook his favorite, Spaghetti!! Prepare Sauce : Heat oil in a pan, and add onions and garlic, fry for few mins. Add Tomatoes, Chilli and Sugar. Cover and Cook in low heat for about 15 to 20 min, till tomatoes are done. Add Basil leaves and season with salt and pepper. Let it cool, and transfer to a blender, and blend to a coarse paste. For Pasta : Prepare Spaghetti according to instructions and set aside. In a wide pan, heat oil. Add Jeera, garlic and onions, fry for few mins. Add dried oregano and basil. Now add the veggies(Carrots, peas, beans), season with salt and cook on low till the veggies are done. Add kitchen King and prepared tomato sauce. At last add Spaghetti and toss. If the tomato sauce yields more than 1 and half or 2 cups, store the remaining in a bottle and keep it in refrigerator. You can store this for about 10 days. You can add garam masala if you don’t have kitchen king. Wow looks yummy and delicious …. That is a very very interesting fusion food. 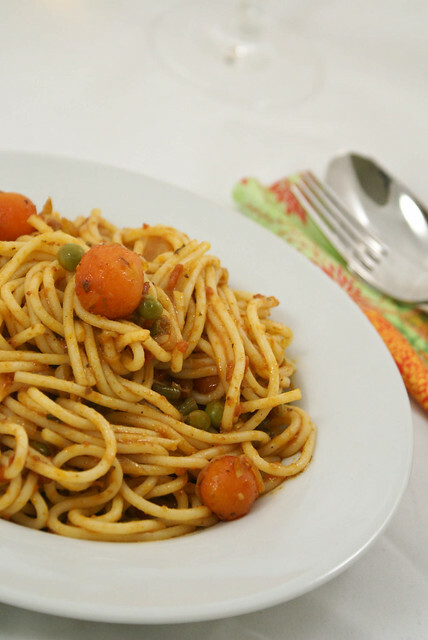 Mixing jeera with Spaghetti sounds so warm and hearty! Wow..I am speechless cing ur blog..Nice presentation.. Very interesting.I will definitely try it on Sunday. 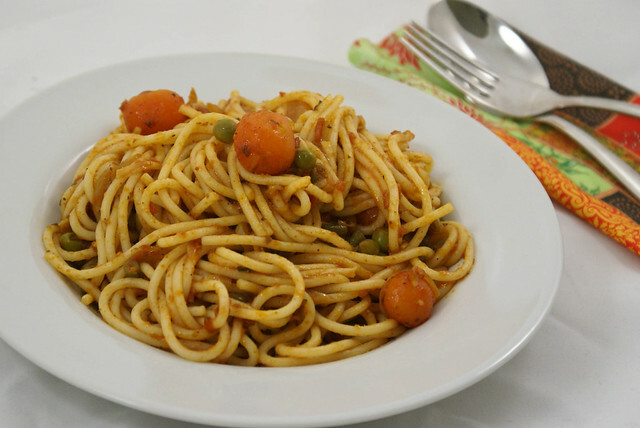 This looks really delicious..I should try this as soon as possible.thanks for the recipe dear..Following your blog straight away..If you have time Check out my blog too..
You know, I saw this flash across your animated header and had to click on it….Jeera Spaghetti?! Now we’re getting somewhere!